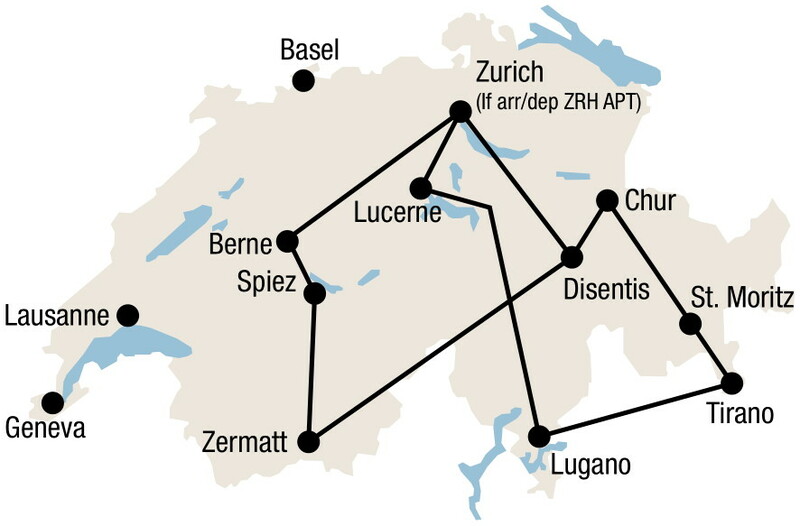 This Swiss railway journey starts with a 1 night stay in Lucerne, the heart of Switzerland. Then it takes you to the Italian speaking part of Switzerland for 2 nights in Lugano. Then you will travel via the Bernina Express scenic train to St. Moritz in the Engadin, where you will also stay 2 nights. Next you will transfer on the famous Glacier Express to Zermatt for 2 nights to see the famous Matterhorn. This package includes all rail transportation, overnights in 3 or 4-star hotels with breakfast, seat reservations on Bernina Express and Glacier Express, a travel by train through Switzerland. Starts any day between April 1 and October 13, 2019. Swiss railway journey from Lucerne to Lugano. Experience the new Gotthard Base Tunnel – with 57 kilometres it is the longest train tunnel in the world. It takes only 17 minutes to travel this fast flat-track route under the Alpine massif in the heart of Europe. Optional add the Gotthard Panorama Express. Overnight in Lugano. Departure with the famous Bernina Express (coach transfer) to Tirano (Italy). From there by train over the Mount Bernina to St. Moritz. This exciting trip takes you by trian through Switzerland three cultures from palm trees across the regions of eternal snow to the valley of the young Rhine. Overnight in St. Moritz. Time at leisure for excursions. Overnight in St. Moritz. Today you board the Glacier Express for one of the greatest Swiss railway journeys in the world. On an 8 hour rail journey the world's slowest express train through Switzerland takes you across 291 bridges, through 91 tunnels and across the Oberalp Pass at 2’033 metres in altitude. Travel in comfort through the unspoilt natural beauty of a landscape rich in ancient, fragrant mountain forests, peaceful Alpine meadows, rushing mountain streams and mountain valleys, soaked in tradition and centuries-old culture. Overnight in Zermatt. Full day at leisure in Zermatt. We suggest either an excursion to the Gornergrat or the Matterhorn Glacier Paradise. Overnight in Zermatt. Swiss Transfer Ticket Combi: Rail Adventure (5 transfers) in 2nd class from/to Swiss border or airport. Seat reservation for Bernina Express (coach and train) and Glacier Express. 1 night in Lucerne, standard room, with private facilities, breakfast. 2 nights each in Lugano, St. Moritz and Zermatt, standard room with private facilities, breakfast.